Every architectural design emerges from a process. The different tools and media constitutive of these processes in turn foster approaches to architecture, as well as the creation of new categories of knowledge. With the progressive development of computer-based design techniques, the contemplation of the procedural aspects of architecture becomes increasingly significant for the production and reception of architecture. 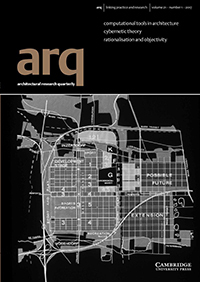 It is from this perspective that this special issue sets out to examine the specific roles that processes and practices play in computer-based design by seeking to illuminate those techno-cultural contexts and historical and intellectual bonds that unite them. Which traditions and strategies, and what historical correlations among architecture, culture, and technology, have motivated and shaped the development of computer-based design processes?